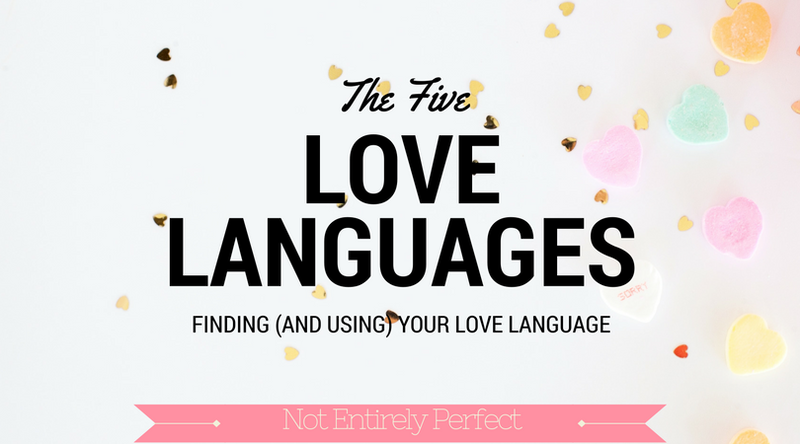 I've mentioned the idea of love languages before, and particularly Gary Chapman as an author. Love languages, simply, is the concept from the book he wrote in which he says everyone expresses love in one of five ways. (That book has near perfect 5 star reviews. Crazy. But understandable!) He says you likely have one or two dominant languages, and figuring out what yours is and what your loved ones' are is so important to your happiness and being able to fulfill your needs. I definitely agree with this - many arguments are avoided once you realize that you don't feel loved by the particular way your spouse has been trying to show it. It's pretty quick and easy to take this quiz and find out your love language is, if you aren't able to tell just from my descriptions. I do recommend getting the book, if you're interested in the topic, because it has a lot more specific examples which can really help, particularly in the instance of two people having completely different love languages and learning to show love in that different way. So let me give you a little overview of the 5 different ones I'm talking about. And since I love to talk about myself and how things relate to me (this is why we blog, right? ), I'm mostly talking about how the languages relate to my own life. If your love language is receiving gifts, it means that you feel most loved when someone you care for gifts you something. This does not have to be big or materialistic in any way. It just means that you appreciate that someone was thinking about you and took the time to pick something they knew you would like. It could be as simple as your husband stopping at the grocery on the way home to pick you up your favorite candy bar or pack of gum. It's not the price, it's the fact that he thought of you and went out of his way for you - you appreciate the effort more than the gift, and the gift is just a tangible sign of that effort. I'm fairly low on this one. Not the lowest, but I only scored about a 3. I recognize that this is a common love language for people though, so I've gotten good at gift giving. I try to be really thoughtful with what I'm gifting, rather than spendy. That way, the recipient knows my emphasis was in really thinking about them as a person. If your love language is quality time, you feel most loved when you spend time with the person you care about and they give you their undivided attention. The undivided attention part of it is key. This is more than just watching tv together on Wednesday night after ordering in pizza. It means putting the phones away and actually paying attention to the conversation, not the tv or the phone. If your love language is words of affirmation, you feel most loved through words that lift you up and encourage you. This isn't just 'I love you,' though that's certainly part of it. It's also hearing 'you look nice today,' 'you did a great job in that presentation,' or 'congrats on acing that test, you're so smart.' It's about getting an unsolicited compliment about something specific about you. Like I said, this is about even with quality time and it's not super important. I always appreciate when someone tells me I look nice, especially after I put some effort into my hair and makeup that day. And just a verbal acknowledgement that I did something helpful (or a nice thank you note) is really all I need, as opposed to a gift or something. Again though, not make or break! If your love language is physical touch, you feel most loved by someone you care for touching you, such as hugs, hand holding, sitting close, anything that puts you in physical contact. I'm like, a 0 in this category. I think that's why I don't even have a longer descriptor for it, or more examples. My personal space bubble is huge. I like physical touches with John, but I certainly don't need them and they aren't high on my list (obviously.) From other people? Just, no. And John's family is full of huggers, so that took some getting used to for sure. I struggle with this one when someone's love language is physical touch, I'm not very good at giving love this way! If your love language is acts of service, you feel loved when someone does a task for you. Whether it's helping around the house or running errands when they know you're too tired, you believe 'actions speak louder than words,' so the opposite of those who value words of affirmation. It's especially clear someone loves you when they do something for you that you know they don't like doing. This is my love language, almost to the exclusion of any of the others. With the way the quiz is set up, you can't actually exclude all of the others, but if it could be done, it would be by me. I'm a big 'actions speak louder than words' person, so you can tell me you love me all you want but I probably won't believe it until you do something for me. Particularly something that I hate doing, or have difficulty doing. For example, I loathe taking the trash out. Always have. This is solely John's job, but that's how I know he loves me. I mean, who doesn't hate taking the trash out? The fact that he does it anyway, never even asking me to do it, that's love. Also, anything that requires a car, because I don't have one! I can do most things easily without one, but some things are tougher - getting Hawkeye to and from the groomer or vet, for example. So when people offer to help me with the stuff like that, that means more than any of the other languages. Obviously, this is how I show love as well, at least most easily. I'm likely to show people I love them by taking them to the doctor, bringing them groceries, and the biggest one: helping them clean and organize. Something I'm good at, but other people struggle with. But I wouldn't offer if I didn't like you. Most people feel loved through any of the 5 of the languages (except me, I guess - no touchy) but will have one or two primary love languages. I find the whole thing fascinating and I can see how it's true not just in my relationship but also with my family and friends. So, which one are you? Same or different language than your loved ones? Is there any one that you struggle with, like I do? Tell me in the comments.